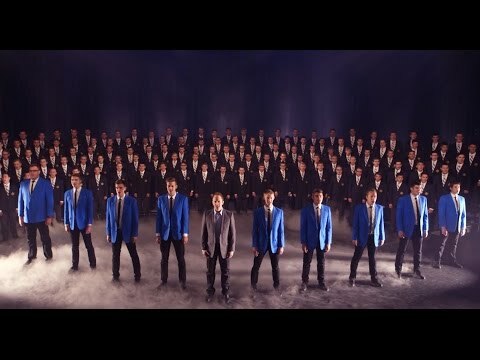 Brigham Young University's Men's Chorus and a capella group Vocal Point collaborated to perform the Christian hymn "Nearer My God to Thee." In a music video released Tuesday, the two groups perform a version of the song written by former Vocal Point director James Stevens. Stevens is also the lead soloist in the video. According to the video description, the Vocal Point version of "Nearer My God to Thee" was the most popular song for the group on iTunes. Now, with the help of the Men's Chorus, the group hopes to spread the message further. "We put all we’ve got into every music video we make, but this one is particularly special to us. We want millions of people to hear this song and feel its powerful message," BYU Vocal Point wrote on Facebook. "James Stevens' arrangement of this Christian hymn creates a feeling that is less about peace and more about the struggles in life that bring us closer to God," the video description stated. Many viewers online expressed their appreciation for the talent and emotion displayed in the video. "Holy cow! That was spectacular," Tennyson Miller wrote on Facebook. "This was already one of my absolute favorites and then you had to go and add an entire choir behind you singing the Latin and made it 80 times cooler! Well played BYU Vocal Point. Well played indeed." "Two of my favorite groups at BYU, together, singing an incredible arrangement of this powerful hymn," Jacob Goldman wrote on YouTube.